WASHINGTON, DC, February 5, 2017 (ENS) – The health hazards of perfluorinated chemicals, or PFCs, are well known to scientists, yet some fast food chains still use food wrappers, bags and boxes coated with these grease-resistant compounds, according to nationwide tests reported in a new peer-reviewed study. PFCs are nonstick, waterproof, stain-resistant chemicals that companies have used since the 1950s in consumer products and industrial applications. 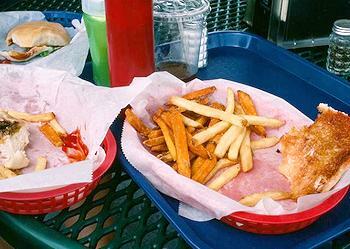 “PFC-based coatings are applied to food wrappers, bags and boxes to stop grease from dripping through. But the hot, often fatty foods served in those papers pick up the chemicals, and when the food is consumed, so are the chemicals,” write Environmental Working Group, EWG, senior scientist Dave Andrews and Bill Walker, managing editor of the EWG blog, describing the testing conducted for the study. Scientists from nonprofit research organizations including EWG, federal and state regulatory agencies and universities collaborated to test samples of sandwich and pastry wrappers, french fry bags, pizza boxes, and other paper and paperboard from 27 fast food chains and local restaurants in five regions of the United States. They found that of the 327 samples used to serve food, collected in 2014 and 2015, 40 percent tested positive for fluorine. The paper samples were collected from restaurants in and around Boston, San Francisco, Seattle, Washington, DC, and Grand Rapids, Michigan. Fast food chains tested for fluorine in wrappers and containers ranged from zero to 100 percent of samples where perfluroinated chemicals were found. 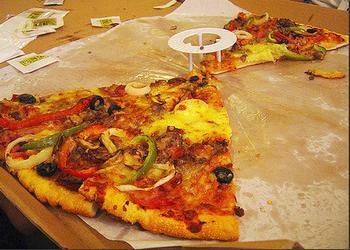 The chains where all wrappers and containers tested positive for fluorine were: Taco Time, Quiznos and Jimmy John’s. The chains where no wrappers, boxes or bags contained fluorine were: Carl’s Jr., Checkers, Culver’s, Domino’s and Round Table Pizza. The other chains fell somewhere in between. On the high end were: Chik-a-Fil-A, Chipotle and Starbucks. On the low end were: Arby’s, Burger King, Dairy Queen, Jack in the Box, KFC, McDonald’s and Wendy’s. See the entire chart here. The presence of fluorine does not automatically indicate the presence of PFCs, write Andrews and Walker. But one of the study authors is a U.S. Environmental Protection Agency expert who, in further tests of a smaller number of samples, found that the majority of materials he tested contained known PFCs, they explain. Some, but not all studies in humans have shown that certain perfluroinated chemicals may affect the developing fetus and child, including possible changes in growth, learning, and behavior. They may decrease fertility and interfere with the body’s natural hormones, increase cholesterol, affect the immune system and increase cancer risk, according to the U.S. Agency for Toxic Substances. PFCs are persistent in the environment and have built up in the bodies of people and wildlife worldwide. The Centers for Disease Control and Prevention have found PFCs in the blood of virtually all Americans, and in 2005, tests commissioned by EWG were the first to show they are passed from mother to child through the umbilical cord and breast milk, Andrews and Walker explain. The U.S. Food and Drug Administration has approved 20 next-generation PFCs for coating paper and paperboard used to serve food. But EWG argues that these chemicals have not been adequately tested for safety, and trade secrecy laws mean that, in some cases, the limited safety data submitted to the EPA does not publicly disclose the identity of the specific chemicals or even the companies submitting them for approval. What little information manufacturers have provided to regulators is “troubling,” write Andrews and Walker. In documents filed with the EPA, DuPont reported that a next-generation chemical used to produce food contact paper, called GenX, could pose a “substantial risk of injury,” including cancerous tumors in the pancreas and testicles, liver damage, kidney disease and reproductive harm, they write. EWG is advising that fast food companies stop using PFCs or other fluorinated compounds in wrappers, containers and pizza boxes or wherever they might come into contact with food. “The FDA should further restrict the use of fluorinated chemicals in food or food contact materials. The FDA should close the loophole that allows companies to self-certify chemicals as Generally Recognized as Safe,” write Andrews and Walker. PFC-free paper is easily available, and the tests found no fluorine in more than half of the paper samples. 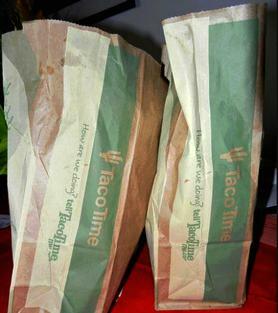 Depending on where they are, individual fast food restaurants or regional franchise groups in the same chain may get their wrappers and containers from different suppliers. So parent corporations may not know if outlets are using PFC-coated paper or if suppliers are accurately disclosing whether their paper contains such chemicals. Some of the containers that tested positive for fluorine may not have been intentionally coated with perfluorinated chemicals, but were made from recycled paper containing PFCs. “Parent companies should exercise more oversight over their supply chains and the paper sources of their franchises,” Andrews and Walker recommend. For consumers, exposure to PFCs in food wrappers can be reduced by eating fresh foods and preparing meals at home, they advise. Avoid the use of paper tableware and microwave popcorn. For more tips on how to keep these chemicals out of your body and your home, see EWG’s Guide to Avoiding PFCs.